The United Launch Alliance (ULA) Delta II launch vehicle has finally launched at the fourth attempt, lofting COSMO-4 – the fourth and last COSMO-SkyMed radar imaging satellite – into orbit for the Italian government. The vehicle lifted-off at 7:20pm PDT from Space Launch Complex 2W at the Vandenberg Air Force Base. The mission marks the 350th launch of a Delta rocket. The opening launch attempt on Sunday was scrubbed due to an “engine section heater” issue, prior to a 24 scrub turnaround being called. The second attempt, again tracking a 7:20pm PDT T-0 suffered a hold with around two minutes remaining in the countdown. Due to the one second launch window, the attempt was scrubbed. The United Launch Alliance (ULA) noted the issue was associated with the Gaseous Nitrogen purge. The third scrub was caused by a low voltage reading on the second stage, scrubbing the launch for 48 hours in order to allow the crews to rest ahead of the next attempt. “During the terminal launch countdown on Tuesday, at approximately one minute before launch, mission managers noted a low second stage battery voltage reading. This battery is used to power the electrical systems on the Delta II second stage during flight,” noted ULA. “To allow for crew rest after three straight days of launch attempts and engineers the time required to correct this issue, the next launch attempt is scheduled for Nov. 4.” However, this was delayed further to November 5, again at 7:20pm PDT. 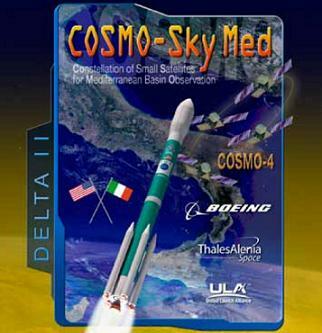 The COSMO-SkyMed programme is a partnership between ASI (the Italian Space Agency), the Italian Ministry of Defence, and e-GEOS, a commercial organisation. It consists of four satellites, of which COSMO-4 will be the last, which have all been launched by Delta II rockets over the last three and a half years. The first satellite, COSMO-1, was launched on June 2007, and was followed by COSMO-2 and 3 in December 2007 and October 2008 respectively. The satellites produce images using 9.6 gigahertz synthetic aperture radar, and transmit them to Earth. The images are used for defence, scientific, disaster monitoring and commercial purposes. Along with France’s Pleïades satellites, which are expected to launch next year, COSMO-Skymed forms part of the Orfeo programme, a collaboration between the French and Italian governments to share satellite reconnaissance capabilities. COSMO-4, like its three predecessors, was constructed by Thales Alenia Space, formerly Alenia Spazio, and is based around the Prima satellite bus. This bus has also been used for the Canadian Radarsat-2 spacecraft, and will be used for four of ESA’s Sentinel spacecraft. The spacecraft has a mass of 1,900 kilograms, and is expected to operate for five years. The flight will use Delta 350. The rocket will fly in the Delta II 7420-10C configuration, comprised of four GEM 40 solid rocket motors augmenting an Extra-Extended Long Tank Thor first stage, a Delta-K second stage, and no third stage. A three metre (10 foot) payload fairing will encapsulate the satellite, protecting it from the pressures acting on the vehicle as it climbs through the atmosphere. Two seconds before launch, the RS-27A main engine of the first stage, along with two LR-101-NA-11 vernier engines, will ignite. The first stage engines burn RP-1 propellant, which is oxidised by liquid oxygen. When the countdown reaches zero, the solid rocket motors will ignite, and Delta 350 will begin its ascent towards orbit. Thirty and a half seconds into the flight, the rocket will reach Mach 1, the speed of sound. Just under fifteen seconds later, it will pass through Max-Q, the area of maximum dynamic pressure. The solid rocket motors will burn out sixty four seconds after launch, and following a seventeen and a half second delay to avoid debris falling on oil rigs off the Californian coast, the motors will be jettisoned. Eighty five seconds after launch, the rocket will begin a dogleg manoeuvre to optimise its flight azimuth for achieving its target orbital inclination. The manoeuvre will last thirty five seconds. Four minutes and twenty four seconds into the flight, the first stage fuel will be depleted, and the main engine will cut off, followed a few seconds later by the two verniers. These events are known as MECO and VECO respectively. Eight seconds after MECO, stage separation will occur, with the second stage’s AJ-10-118K engine igniting five and a half seconds later. The second stage uses hypergolic fuels; Aerozine-50 propellant and dinitrogen tetroxide oxidiser. This will be the first of four burns made by the second stage during Delta 350’s mission, two of which will occur whilst it is still carrying the payload. The payload fairing will separate from around the spacecraft approximately four seconds after the second stage ignites. The exact time of separation will be determined by sensors detecting that the rate of free molecular heating on the vehicle has fallen to or below 1,135 watts per square metre (0.1 British thermal units per square foot per second). The second stage’s first burn will last six minutes, 43.6 seconds, and will leave Delta 350 in an initial orbit with an apogee of 645 kilometres, a perigee of 185 kilometres, and 97.8 degrees of inclination. During the first burn, at a mission elapsed time of seven minutes, 17.5 seconds, the Command Receiver Decoders on the vehicle will be deactivated. The Command Receiver Decoders are devices used by range safety to activate the rocket’s flight termination system in the event of a failure. The Delta II’s flight termination system has only ever been used once, on the January 1997 launch of the first GPS IIR satellite, when the rocket’s onboard computer issued a self-destruct command after detecting the premature separation of a solid rocket motor. The first burn of the second stage will end with cutoff, SECO-1, just over eleven minutes and twenty five seconds into the launch. The rocket will then begin a coast period lasting a little over forty two minutes. At mission elapsed time fifty three minutes twenty seven seconds, the stage will ignite for its second burn. This will last 12.4 seconds, and will end with the second cutoff, SECO-2. Delta 350 will then reorient for spacecraft separation, which is expected to occur exactly fifty eight minutes after launch. COSMO-4 will separate from the carrier rocket into a low Earth orbit with a perigee of 631.5 kilometres, an apogee of 619.9 kilometres, 97.86 degrees of inclination to the equator, a semi-major axis of 7006.7 kilometres, with 0.00127 eccentricity. The satellite will cross the equator on an ascending node two minutes and 1.5 seconds after separating from the rocket. After spacecraft separation, the second stage will manoeuvre away from the satellite and perform two further burns. Half a second after separation, helium blowdown will be used to manoeuvre away from the spacecraft. This manoeuvre will last forty one and a half seconds, and will provide a total delta-v of 0.5 metres per second. One hour, sixteen minutes and forty seconds after launch, the third burn will begin, with the AJ-10 engine firing for five seconds to lower the perigee of the stage’s orbit, and to manoeuvre farther away from the payload. Nine minutes and fifty five seconds later the stage will ignite again for its final burn to dispose of propellant. This burn is expected to last 28.7 seconds, leaving the Delta-K in a 178 by 617 kilometre orbit, inclined at 98.35 degrees. It will then be left to decay from orbit naturally. The launch marks the 350th flight of a Delta rocket. This figure includes modern rockets such as the Delta III and Delta IV, which have strayed away from the series’ traditional design, and excludes vehicles built under licence in Japan as the N-I, N-II and H-I. The first Delta launch occurred in May 1960, and failed to loft the first Echo communications satellite. Early in the programme, the rocket was known as Thor-Delta, with the name Delta relating to the second stage. The rockets consisted of a Thor missile, the Delta second stage, and depending on mission requirements, a solid third stage. The Delta stage was derived from the Able, originally developed for the Vanguard rocket, but enhanced by the addition of a gaseous attitude control system. The basic design was modified many times during its service life, with its LEO payload capacity increasing from less than 300 kilograms on the original Thor-Delta to over 6,000 kilograms with the Delta II 7920H. Delta 350 will launch from Vandenberg Air Force Base’s Space Launch Complex 2W. This facility was built in the 1950s as Launch Complex 75-1-2, and was used by the 75th Strategic Missile Squadron of the United States Air Force, and the Royal Air Force, to test Thor missiles and train crews in their operation. Orbital launches from the complex began in 1962, with Thor-Agena rockets. 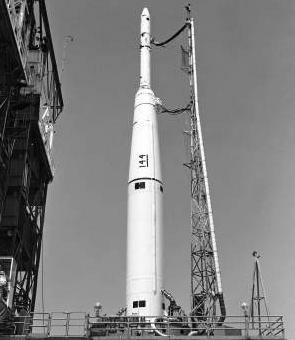 The first Delta from SLC-2W launched in 1969. The Delta II first used the complex in 1995. The launch is the 148th flight of the Delta II, with three more remaining to be flown. Components for five further rockets exist, however they have not yet been assigned to any specific payloads, and the rockets have not yet been assembled. The next Delta II launch is currently scheduled to occur on 9 June 2011, with the Argentine SAC-D satellite. The other two remaining launches are those of the GRAIL lunar probe, and the NPP weather satellite, both of which are also scheduled to occur next year. 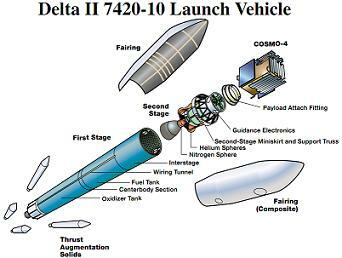 This will also be the final flight of the Delta II 7400 series and the 7420 configuration. The 7400 series, along with the 7300 series, was developed as part of NASA’s “Med-Lite” requirement for a rocket to launch payloads too large for small rockets like Pegasus and Athena, but too small for the heavier Delta II 7900 series. The Delta II 7420 was the first member of the 7400 series to fly, and made its maiden flight in February 1998. Its first seven launches each deployed four Globalstar communications satellites, and following the seventh Globalstar launch, which occurred in February 2000, the configuration was not used again for over six years. In April 2006 A Delta 7420 launched the CALIPSO and CLOUDSAT spacecraft for NASA. This launch was followed by those of the first two COSMO-SkyMed satellites in 2007, and the GeoEye-1 commercial imaging satellite and COSMO-3 in 2008. The launch will be the thirteenth flight of the configuration, and the eighteenth of the 7400 series. The other members of the 7400 series, the 7425 and 7426, were three-stage configurations topped with Star-48B and Star-37FM upper stages respectively. The 7425 made four flights, the first of which occurred in December 1998, carrying the Mars Climate Orbiter. Subsequent launches carried the Mars Polar Lander and Deep Space 2, the Wilkinson Microwave Anisotropy Probe, and the final flight, which occurred in July 2002, carried CONTOUR. Although all four launches were successful, WMAP is the only spacecraft launched on a Delta 7425 to have achieved any success; CONTOUR exploded around a month after launch as it attempted to depart Earth orbit, MCO flew into the atmosphere of Mars due to a unit conversion error, and MPL was lost when it attempted to land on Mars. The only launch of the 7426 configuration occurred in February 1999, and carried the Stardust spacecraft bound for the comet 81P/Wild 2. The next Delta launch is scheduled to occur on 15 November, when a Delta IV Heavy will orbit the NRO L-32 payload for the US National Reconnaissance Office. NRO L-32 is believed to be either a Lacrosse radar imaging satellite, or a Mentor signals intelligence spacecraft, although its exact purpose is classified.